Next to the well there is an old wall. When I come back from my work the next evening, I see the little prince from some distance. He is sitting on top of the wall. He is talking to somebody. I continue my walk to the wall. I still can’t see or hear anybody. But the little prince says again, “Sure. You can follow my steps in the sand. You only have to follow me to that place. It can all happen tonight. I stop. My heart is beating strongly. But I still don’t understand the situation. 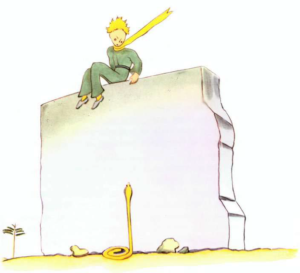 “Now go away,” says the little prince. “I want to go down from the wall”. Then I look down at the sand under the wall. I am shocked. There is a yellow snake there. It is a snake which can kill you in thirty seconds. I want to take my revolver. But when I am trying to take it, I also make a step back. The snake hears it. He starts to move and he is quickly gone in the rocks. I still hear him but I don’t see him. I come to the wall. I catch the little prince in my arms. His face is very white. He looks at me. His eyes are sad. He puts his arms around my neck. I feel his heart. His heart is beating like the heart of a bird which is dying. I am here because I want to tell him that my work is finished.